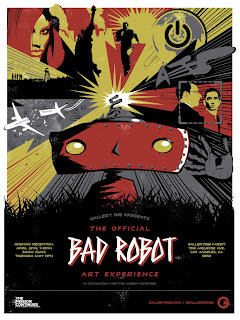 This friday, April 26th is "The Official Bad Robot Art Experience" at Gallery 1988. Most likely if you follow my blog, then you're well aware of how awesome this show is going to be. Bad Robot is the production company run by J.J. Abrams, and over the years, they have brought us some of the best television and movie experiences such as LOST, Cloverfield, Super 8, Alias, and a little thing called Star Trek. Bad Robot and Gallery 1988 are teaming up to bring to Los Angeles "The Official Bad Robot Art Experience", featuring over 100 illustrators creating artwork based off some of Bad Robots awesome work. Also, some of the proceeds will help benefit "The Mission Continues", an excellent organization that "...awards community service fellowships to post-9/11 veterans, empowering them to transform their own lives by serving others and directly impacting their communities." I am very excited for this show. 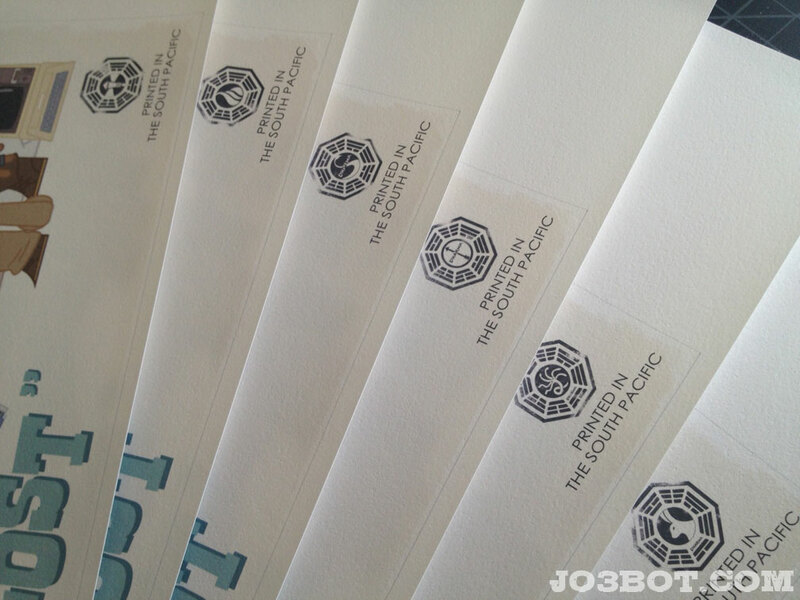 When I first learned about it, I immediately knew I wanted to do a LOST piece for the show. I love LOST. It's one of my favorite shows, and while some people like to hate on the show, and unjustly bash the writers for "not having a plan", I'd like to thank them for creating one of the most imaginative, compelling, and well told stories that's ever aired on network television. For every LOST, we get a hundred CSI's. LOST is so dense, so unique and quite an accomplishment that I fear will never be repeated again. Where the x-files trailed off and went out on a somewhat sour note with the final 2 seasons, LOST had a chance to develop an end-game and went out swinging, and for that, I'm thankful to Damon Lindelof and Carlton Cuse. Get ready to put your Seat back and your tray tables in their upright and locked positions, it's Jack and the Survivors! Join Jack, Kate, Sawyer, Hurley, and more as they crash into your heart with their new hit album "LOST", featuring hit songs like, "Don't Tell Me What I Can't Do", "You All Everybody", and "Namaste". 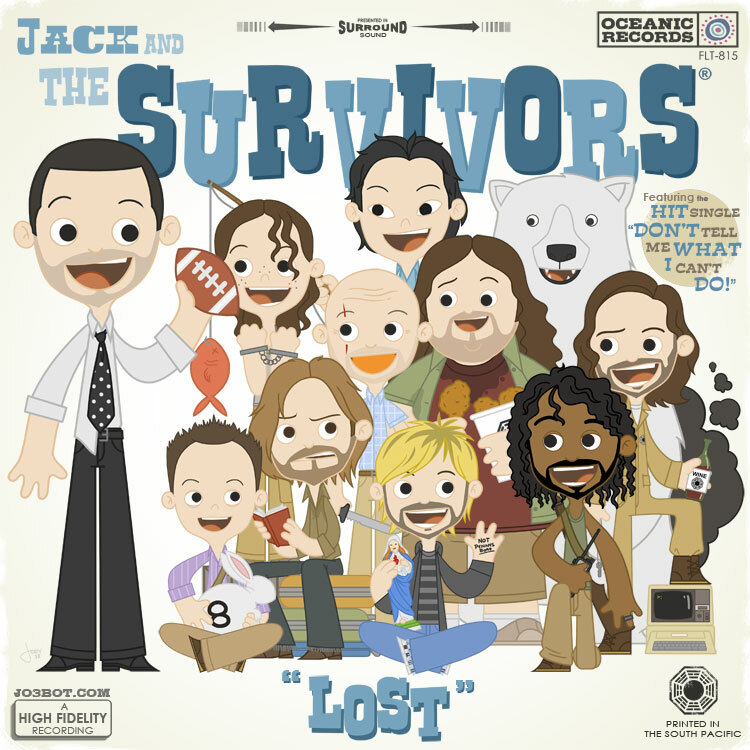 Get ready for a mind-blowing, time traveling good time and flashback with "Jack and the Survivors"! 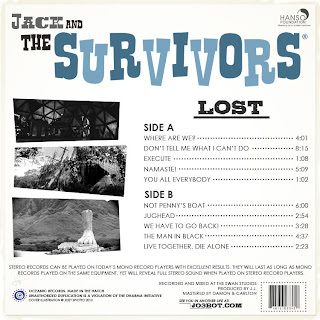 LOST featured a lot of hidden messages to those willing to spend the time to look for them, and my album artwork along with the back of the album follows the trend. Here's the back of the album with full track listing along with some other hidden goodies. Also, for each show I make a one of a kind framed album. 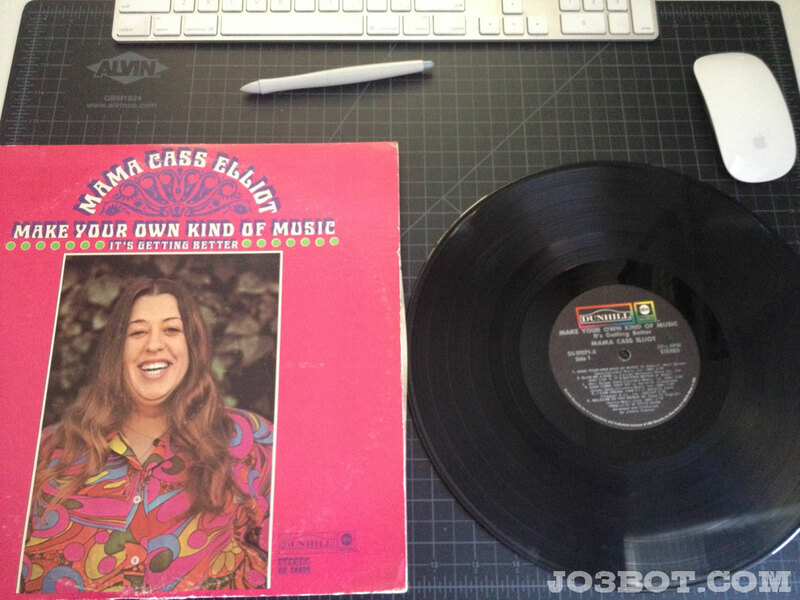 The albums included with the artwork are always somehow related to the theme of the piece. There is a lot of excellent artwork in this show, and a lot of very talented artists that have in some way been influenced by the very talented people at Bad Robot. If you're in the Los Angeles area, you won't want to miss out on this exciting opening. Also, some of your money gets to go to Veterans who have risked their life fighting for our country, and ask for nothing in return. Thank you to our Veterans and for those currently serving overseas and right here at home. So excited! I will have one of everything please. I will have one of everything please. Thank you. Your designs, zey are, how you say, TRES MAGNIFIQUE! Literally just now, my friend was like, "You should check out TeeFury, they have this design you might like!" And I go there and it's this sweet Portal shirt and I'm like WHOA this is SOOO CUTE!! 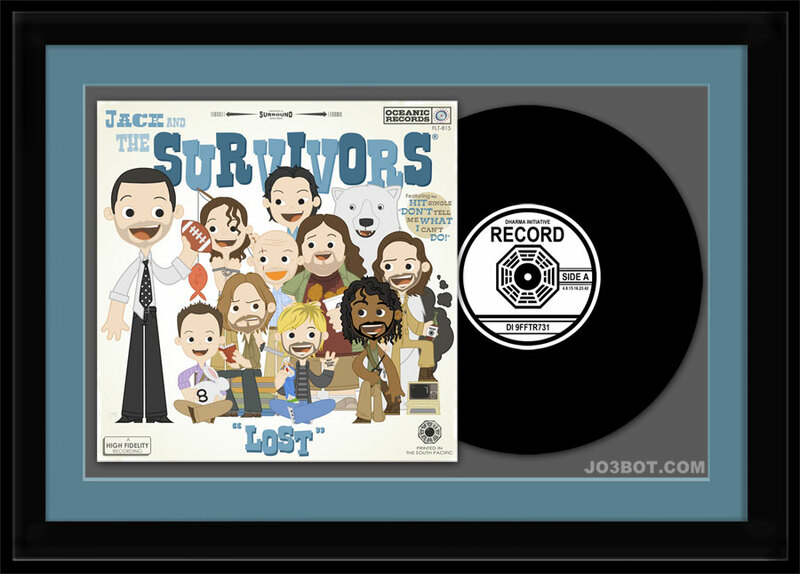 Then I look to the side and I see your Jack and the Survivors piece and the JO3BOT design and I'm like OMG. THIS IS JOEY'S! LOL Anyway I wanted to say hi, it looks like you are doing great!! Genevieve!!! That's so great, glad you liked it! I'm doing pretty good, I hope you are well. I miss seeing your work all the time, so I go check out your blog to feel inspired. Keep up the great work! Are you going to have a table at comic-con this year? It would be great to say hello!